SAN ANGELO, TX — For San Angelo angler Logan Lloyd, hooking the largest catfish he can is what he does for relaxation. 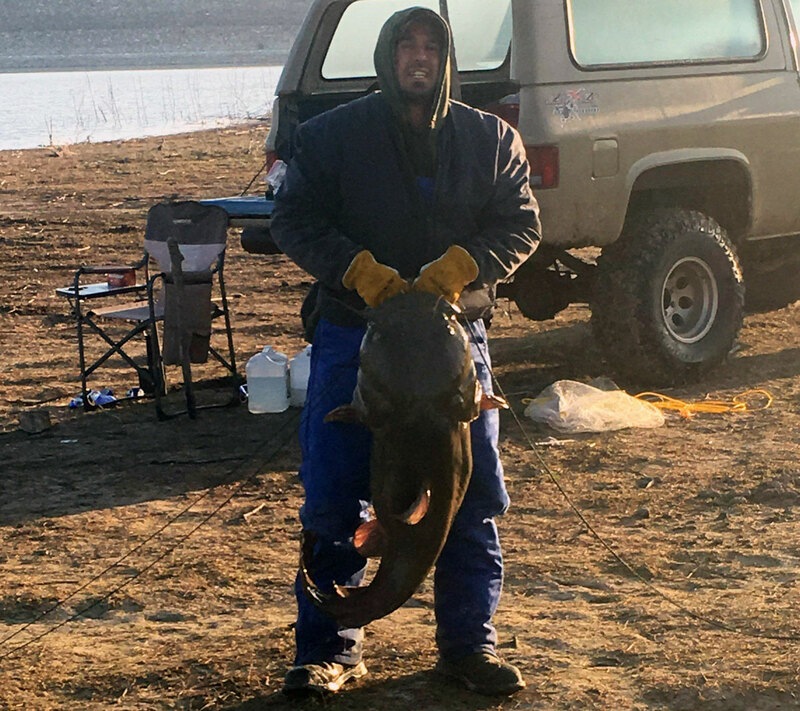 Thursday, in Twin Buttes Reservoir southwest of San Angelo, Lloyd hooked a gigantic 77-pound Flathead Catfish. The fish measures 56-inches long. Lloyd said he caught the monster on a 20-pound fishing line on a 12-foot pole. He was baiting the line with cut shad, about 5-8 inches. 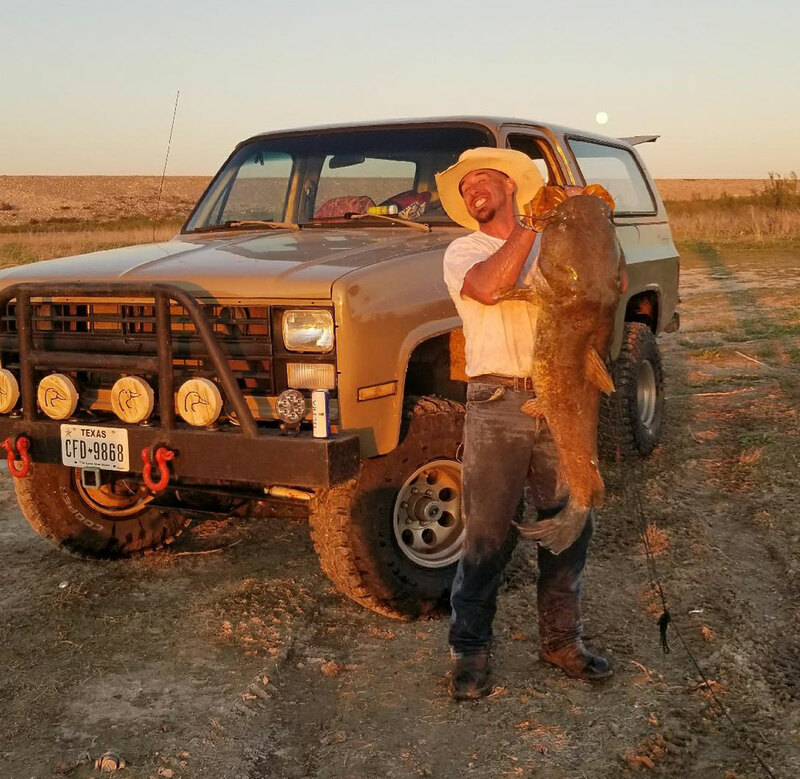 The record size for Flathead Catfish in the state of Texas, according to the Texas Parks and Wildlife Department, is 98.50 pounds and 53 inches, It was caught on Dec. 2, 1998 in Lake Palestine by James Laster using minnows and a crappie hook, according to the TPWD. Lloyd wonders if his catch sets a record for Twin Buttes. He is going to find out Monday. In the meantime, the 77-pound catfish is being kept in a small pool with an air pump to keep the water circulating. Lloyd said he feeds it if it’s hungry. He’s feeding it live 2-5-inch Perch. Jaime Burch at KTXS in Abilene researched the record size of Flathead Catfish ever caught in Twin Buttes. He discovered the current record was made on April 20, 2014 by Roy L. Martin. His catch weighed 73.35 pounds and was 53 inches long. If Lloyd gets his fish officially weighed by the TPWD, and his bathroom scale is close to being correct, he will hold the new record. I had paddled a canoe in some famous rivers around the world. It is a lot of fun to glide across the river with nothing but a paddle. You get to take in all of the nature, but also you have to be aware of the dangers. I got into some class III rapids once, and didn't have a life jacket on. When I paddled my canoe down the Illinois river, there was a variety of twists and turns. That river leads into a place called lake Ten Killer which was named by the Indians based on some fact in history. If you didn't jump off and get on the bank, that river would lead straight into that lake. Someone had told me that divers went down to the bottom of that dam and saw catfish that were larger than a building. I seriously doubt if that thing is any good eating. not as dangerous as some other creatures though. Like a moose. Oh wait, I put some of that on my hair. Growing up eating catfish from the mud bottom Neosho River in NE Oklahoma at Miami, this is what we learned to do to make them edible. If they're still alive, put them in a tank and let a garden hose run in it real slow for 2-3 days even if it runs over into the yard. Hence, a dribble out of the hose to save on a water bill if one is on city/rural water. We were on a well on the farm and could let it run for the 2 or more days. You'll notice that in about 24 hrs, the catfish will be covered/coated in mud and there'll be a "scum" as the clean and fresh water is flushing the mud, etc. from it's meat. Realize that these catfish are scavengers and will eat "almost" anything if they're hungry enough. The running water keeps the scum on the surface running over the edge when the tank is full. Therefore, running clean and fresh water through the tank a few days will clean out and up the catfish very well for eating. We've also caught catfish from a faster moving creek with limestone(rock) and gravel bottom and the difference was night and day in the cleanliness & flavor just due to the cleaner water. We left those fish in the tank with running water as usual and didn't get the mud coating on them and the scum in 24 hrs. neither. Running and clean water is the answer. I've got a picture somewhere of me holding a 64# flathead catfish when I was about 13-14. Did you ever happen to read the letters that Lewis and Clark sent back to Washington. What is the latest word from the frontiers. This is a big place. It has been almost a week since this fine specimen was caught, any word from TPWD confirming a new lake record?